A coin? A bitcoin? No. An actual coin, a physical object, and not the term coined, if you will pardon the pun, for a computational algorithm belonging to the realm of bits and bytes in the digital world. All this fuss about a coin? Well, yes, it seems so. “Is it lawful to give tribute unto Caesar or not?” The Pharisees and the Herodians ask Jesus but only so as to “entangle him in his talk”. All this fuss about a coin turns on an image and a superscription, a picture and the words which surround or are about an image on a coin. Coins as physical objects have a powerful symbolical significance. Jesus uses something as ordinary and basic as a coin, a penny, to teach us something powerful about our identities and the structuring of our loyalties. The picture is an image, a depiction of Caesar, the ruling authority of the political world of Jesus’ day. The superscription identifies in writing that authority. Our coins, to the extent that we still have them, are stamped with the image of the Queen – the sovereign principle of this nation of Canada. All on a coin. It suggests the interplay between politics and economics. It is a much vexed problem which we can never entirely escape. The challenge is to think the relation between economics and politics, on the one hand, and, far more importantly, the relation between them both and spiritual life, on the other hand. It is the latter about which Jesus is most concerned. In a way, it is a question about what is the fundamental nature of reality. Is the real simply the social, the economic and the political? Or does the spiritual and the intellectual, the philosophical and the theological point us to the reality of God which in turn engages the realms of the social, the economic and the political? This gospel story, like so many of the gospel stories, challenges our assumptions. They disquiet and disturb us. This gospel story confronts us with the fundamental question about our spiritual identity. In a way, Jesus’ question is really asking about us in relation to God. Whose image and superscription are we? The analogy here is between the coin, symbolizing economic and political might, and ourselves as made in the image of God as spiritual and intellectual creatures. But if we define ourselves primarily and essentially by money, property, and power then we deny the one in whose image we are made and remade. It is the challenge and the issue for contemporary culture. What is a means to end, a medium of exchange, becomes instead the defining reality of our lives. We forget what money really is because we forget who we truly are. The consequences are enormous and inescapable. 7:00pm, Capella Regalis Concert, “To Bethlehem with Kings”. 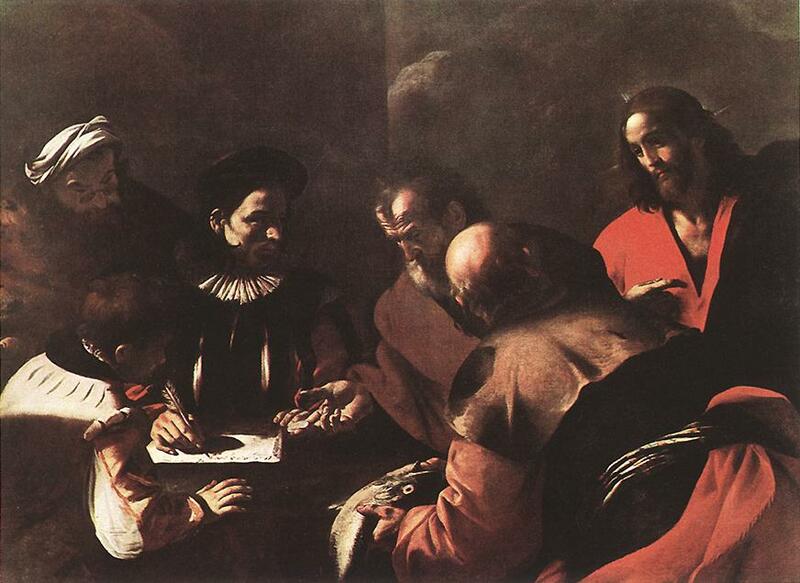 Artwork: Mattia Preti, The Tribute Money, c. 1640. Oil on canvas, Brera, Milan. who love the appearing of our Saviour Jesus Christ.